Spot color is an ink for printing that is mixed to a formula for a specific Pantone® color, much like a can of house paint that is mixed to a swatch color. Spot color inks are very accurate for printing and some spot colors exceed the gamut of color possible with process colors (CMYK ink combinations). Spot color is also used in print design files to designate varnish, embossing, foil or dielines (set to overprint) – so that these elements remain specific in the file and are not split up into tones of cyan, magenta, yellow and black upon final output. What are the advantages of spot color? First, spot colors are accurate and predictable for printing specific colors matched to a Pantone® swatch book. Many companies use spot colors for identity and corporate communications such as letterhead and envelopes where consistency and branding are critical. Spot color can be an economical choice when full-color pictures are not used in printing but some color is desired. 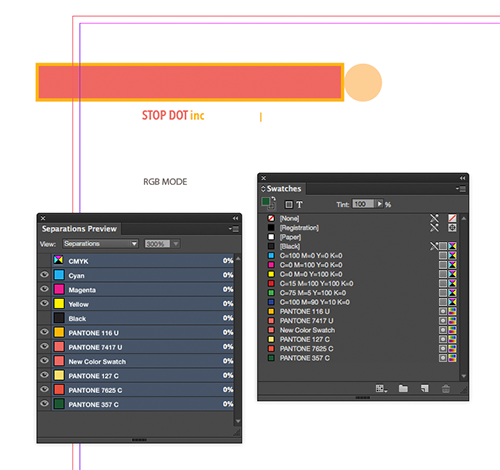 Spot color swatches are available in most layout programs. 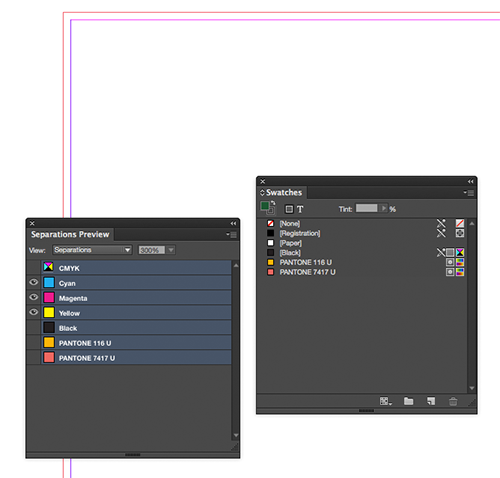 This post will use InDesign® as the example. In the swatches toolbar, choose “New Color Swatch…”, color type “Spot” and color mode will show several libraries of color available. Pantone+ Metallic, Pantone+ Pastels & Neons (Coated and Uncoated), Pantone+ Premium Metallics, Pantone+ Solid Coated and Pantone+ Solid Uncoated are all SINGLE SPOT COLORS. Pantone Bridge or Pantone CMYK colors are Pantone formulations that are made up of PROCESS inks (CMYK values) and those are not spot colors but instead are process (4-INK) colors. (Using Pantone Bridge colors will be the subject of another post.) The icons that appear next to the swatches in the swatch palette are represented by a dot in a square for spot colors, so you can see at a glance which colors are truly spot inks. Pantone+ Solid Coated or Uncoated? Although the ink used when printing is exactly the same (no special uncoated or coated version), it can appear quite different on coated paper than on uncoated paper. It is VERY IMPORTANT to choose the Pantone swatch that matches the paper you will use for printing. It is best practice to refer to an actual Pantone swatch book when choosing a Pantone color. Don’t assume that the same swatch color will appear the same on both coated and uncoated paper. For instance, Pantone 116 Coated is VERY DIFFERENT than Pantone 116 Uncoated. The file you prepare for printing could contain either a coated or uncoated swatch and that makes no difference in the actual printing of the ink since the ink is the same on press either way, but the color of the swatch will APPEAR most accurately on screen and on PDF proofs or drafts when it matches your paper type. 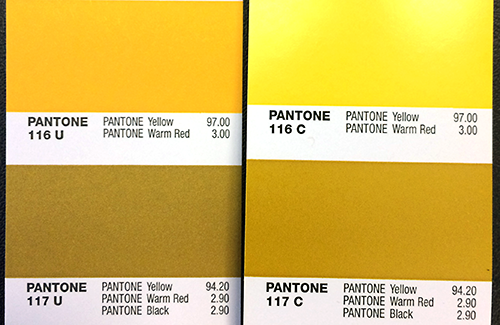 Two bottom yellow swatches are Pantone 116 Coated on Left and 116 Uncoated on Right – properly appear different on screen and on electronic proofs. This is important to keep in mind when you are designing a corporate identity where both uncoated and coated materials will be used. Also consider how specific spot colors translate to process (CMYK) conversions (refer to Pantone Bridge swatches) when choosing spot colors that may sometimes be printed with process ink equivalents. 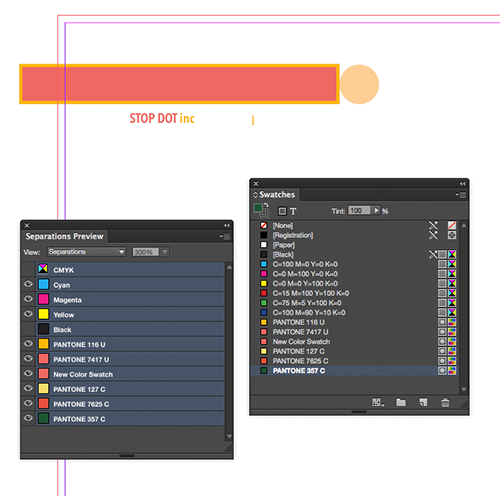 When you’ve determined the spot color(s) to use in your design, add them to the swatches palette. The ink colors that you setup in the print file MUST MATCH the printing specifications of your cost estimate, otherwise, extra costs can occur. The following example will illustrate how to clean up the swatch palette so that the inks used match the printing specification of two spot colors plus black. This is a sample letterhead design where two spot ink colors plus black are going to be used on press. The picture shows that the ink swatch palette has too many colors. Also, when InDesign’s “Separation Preview” is used and Black is turned off, the black text still appears on the layout as a “grey” color. What’s wrong? RGB mode art has been imported to the layout instead of CMYK-mode black art. The Separation Preview Tool is an essential tool to check your layout before making final proofs for either your client or for printing. Use it to check the active color inks in your design, turning them on-and-off to ensure that only the inks you want to print are in your file – no more and no less. The only inks that should be on this example file are Pantone 116 U, Pantone 7417 U and Black. 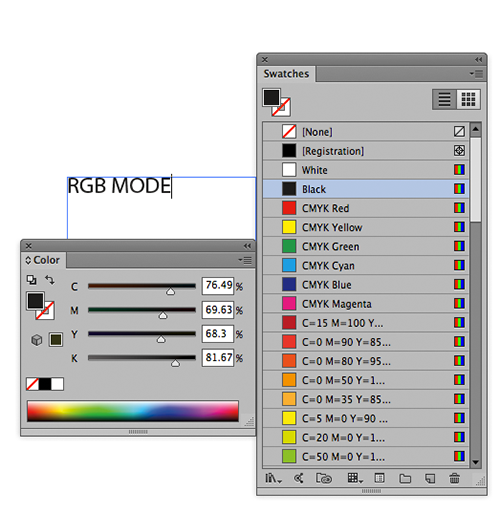 The text “RGB MODE” should be in Black, but when Black is turned off in “Separations Preview” it still shows, because it is not true black but a RGB process mix. There are lots of extra inks in this document. The offending art “RGB MODE” is from an Illustrator file that is in RGB Mode but should be in CMYK mode. This is one of the Top Ten Printing Mistakes we see in our prepress department. 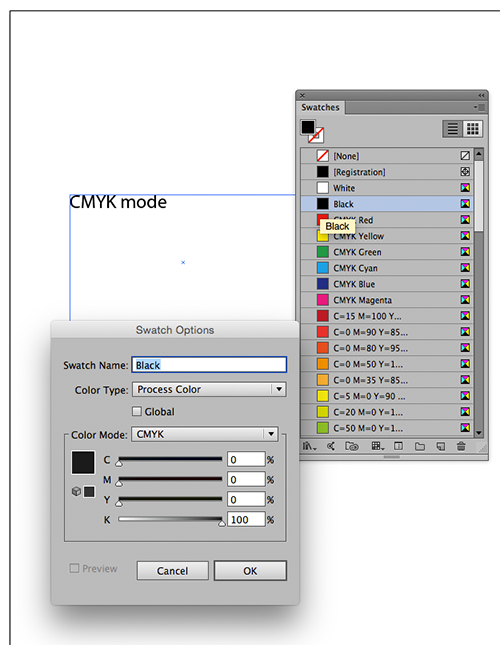 It is easily fixed by making new file that is in CMYK mode, then re-importing the art file into the InDesign layout. This Illustrator art is in RGB mode but should be in CMYK mode in order for the black type to be truly black and not a mix. You can see the mix of CMYK colors used in the RGB Black swatch, shown in the Separations Preview palette of Illustrator. This “CMYK Mode” Illustrator file has text colorized to Black that will indeed print as just black when imported to an InDesign layout. Notice that the “Separations Preview” palette shows 100% black as it should be. 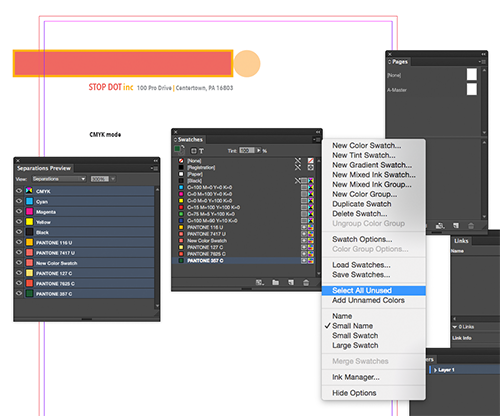 After fixing and reimporting the text from Illustrator, the InDesign file shows the correct black text separating out to just black, but there are still lots of extra spot colors in the file. When the black swatch preview is turned off, the black text disappears properly. Next, all unused swatches should be selected and deleted in the swatch palette. In Swatches Palette, “select all unused” – check the selections to ensure it’s correct and delete the unnecessary swatches. The ink swatches palette is cleaned up for final output or Print-Ready PDF. When the — USED inks are turned off in Separations Preview, everything should disappear on the layout. 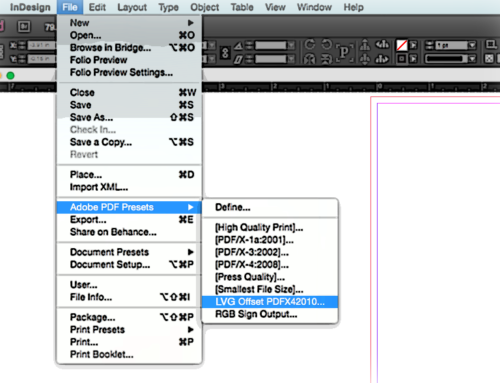 If any element remains visible on the layout after all of your intended printing inks are turned off in Separations Preview, then there is still work to be done to make the file truly “Print Ready”. If you need help working with spot colors for printing – InDesign, Illustrator, Photoshop or Quark – please just call us at 724-539-4545! or email info@lvgraphics.net for help! We are always happy to work with you. Please also see our support page with helpful downloads for file setup and more!